YANGPYEONG, Gyeonggi Province ― Habitually bombarded by stress, feeling pressure from work or school, being trapped in a sea of traffic and constantly blitzed by the chaotic noise of the city are simply some of the unavoidable daily obstacles that the average urbanite experiences in any large metropolitan area. However, with two-thirds of Korea made up of forests, it seems only natural for locals to want to break away from city life and revert back to the laws of nature, seeking out a new life by tasting the peaceful serenity of the great outdoors. Korea has 37 state-run national recreational forests scattered across the nation. Many of them are designated by the government to create recreational facilities where citizens can fully appreciate all that the woods have to offer. The forests offer citizens easy and enjoyable access to the country’s vast natural resources with cheaper entrance fees than other private or government-owned recreational forests. Located at the foot of Bongmisan Mountain are the lush, green forests of Saneum Natural Recreational Forest in Yangpyeong-gun, Gyeonggi Province. A haven of natural skyscrapers of pine, oak and maple, the national park was created as a home away from home for those looking for a quiet place to relax, reflect and repair. Aside from the facility’s abundance of scenic mountain hiking trails, log cabins and fixed campgrounds, the Saneum Natural Recreational Forest is also the country’s first facility that focuses on the concept of healing and relaxation by offering guests complimentary forest therapy sessions. 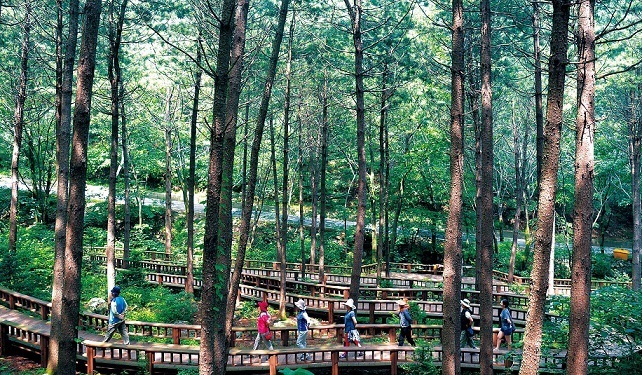 As one of the nearest recreational forests to Seoul, the park has been developed as an area offering urban citizens a chance to escape their worries and take part in the activities of the facility’s healing center, which includes meditation and forest yoga, exercising, dancing and even poetry reading. “Now is gold. Now is the best gift. Now is a miracle, the most beautiful flower seed,” wrote Nah, who is also a published poet and offers special outdoor poetry reading sessions for those who wish to share and express themselves through words as they bask in the wonders of nature and rid their minds of stress. While forest therapy may sound like a New Age, tree-hugging fad, it may nevertheless lead one to clinically feel happier and healthier. Many studies have linked forest therapy with a number of health benefits including reducing stress levels, lowering blood pressure and increasing concentration abilities by helping people ease tension as they reach a meditative state. 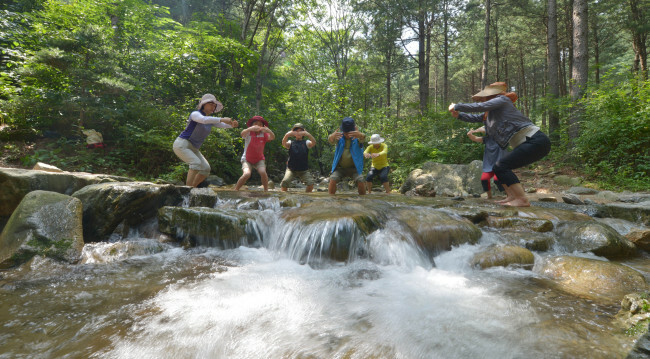 Nah’s forest therapy sessions typically involve students freeing their minds as they participate in various stretches and exercises after a long walk along the facility’s mountain trails. Students are asked to remove their socks and shoes and to wander around the woods barefoot as they participate in classes so that one can truly appreciate the forest with all five senses. Whether it be to get in touch with nature through deep meditation or simply needing a break from the bedlam of living in an urban jungle, taking advantage the nation’s surplus of green areas is an ideal way to find tranquility and solitude. Freedom can be as simple as losing oneself in the wilderness.